About "Exponents with integer bases"
An integer is a number that can be written without a fractional component. Before going to see example problems in this topic, first we have to what is exponent and what is base. For example, if we have 5² we have to multiply the base that is 5 two times. To evaluate this we have to multiply the base(10) seven times. Hence the value of 10⁷ is 10000000. To evaluate this we have to multiply the base(8) two times. Hence the value of 8² is 64. Whenever we have negative exponent for the positive base, first we have to make the power as positive, for that we have to write the reciprocal of base and change the negative power as positive. Let us see some example problem based on the above concept. Hence the value of 4⁻⁴ is 1/256. Hence the value of 3⁻² is 1/9. For example, if we have (-5)² we have to multiply the base that is -5 two times. Instead of repeating negative sign, we can follow a simple method to decide whether the answer will have positive sign or negative sign. If we have odd number as power then the answer will have negative sign. If we have even number as power then the answer will have positive sign. To evaluate this we have to multiply the base(-7) four times. Since we have even power, the answer will have positive sign. It is enough to multiply 7 four times. Don't have to repeat negative sign. To evaluate this we have to multiply the base(-1) two times. Since we have even power, the answer will have positive sign. It is enough to multiply 1 two times. Don't have to repeat negative sign. Hence the value of (-1)² is 1. 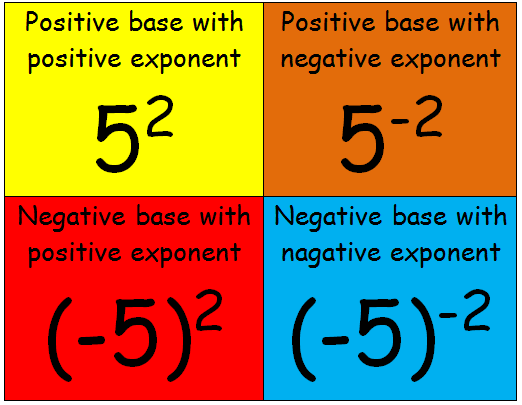 Whenever we have negative base and negative exponent, first we have to convert the negative exponent as positive. For that we have to take the reciprocal of base. So the power the will become positive. Now we have to check whether the power is odd or even. If it is odd the answer will have negative sign. If it is even the answer will have positive sign. Since the power is even the answer will have positive sign. Now we have to multiply 1/7 four times. Hence the value of (-7)⁻⁴ is 1/2401. Since the power is even the answer will have positive sign. Now we have to multiply 1/6 two times. Hence the value of (-1/6)³ is 1/216. After having gone through the stuff given above, we hope that the students would have understood "Exponents with integer bases".